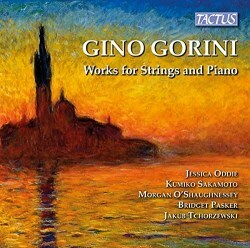 I hadn’t heard of Gino Gorini before encountering this premiere recording of his chamber works with strings, and this programme is a feast of fresh listening. Gorini is best remembered as a performer, and he was a pupil of Gino Tagliapietra and later of Gian Francesco Malipiero. In his booklet note Mario Messinis describes him as “a neoclassical pianist” whose anti-romantic attitude and non-exhibitionist virtuosity reflected the ideas of Malipiero rather than the “monumental piano style of Ferrucio Busoni” and others. You can still find his recordings of the piano work of Malipiero as they have been re-released by Newton Classics. The earlier works in this programme are the most neo-classical, although there is no shortage of passion in the music. Absorbing the influence of Malipiero, the Sonata and Due studi both have a “clean cut, unsentimental lyricism” that is well clear of the fetters of expressionism and any kind of heavy chromatic harmonic basis. The Sonata has a particularly lovely central Andante sostenuto, and the outer movements are filled with lively vibrancy and energetic dialogue between the instruments to create a substantial and very satisfying work indeed. The Due studi opens with a reflective Lentamente that has mystery mixed in with its open textures. The second studi is an Allegro deciso with a folk-like air in its violin writing and sprightly and fragmented melodic shapes. The Viola Sonata takes us into deeper expressive realms. Originally written for viola, piano and strings, the 1974 version here is a transcription by the composer which respects the original as much as possible. Bartok is cited as an influence here, a cross-fertilisation of ideas and moods that was also a preoccupation of Gorini’s friend Bruno Maderna in his pre avant-garde days. The moods of the first two movements maintain “an introverted gravity”, orbiting around modalities that shift our expectations of cadence and stability, without struggling so much against the natural order of tonality that we feel disconnected. From the nocturnal feel of the expressive middle movement there is a beautiful coda taking us into the clouds before our feet are planted firmly on the ground by the final Allegro vivo. The Pavana is a superb stand-alone slow movement, intensely lyrical and expressive, with grief-stricken downward moving melodic gestures and a limpidly clear part played by the piano. With no shortage of ideas in any tempo, I think Gorini is at his strongest in his slow movements, and after the intriguing counterpoint of its opening, the moving Elegiaca second movement if the Quintetto is one of its most memorable. This chamber piece has five movements, including both a Scherzo and a Blues that reveal Gorini’s wit and sense of fun. The music for this recording has been the result of a great deal of effort in unearthing and reviving manuscript scores from the Gorini Archive at the Institute for Music of the Giorgio Cini Foundation. All I can say is all of this hard work has been very worthwhile indeed, and I sincerely hope that these works can take their justified place in the admittedly already vast repertoire for strings. The performances on this well produced recording are all very good indeed, but such works have the potential to evolve and take on a life of their own, and I can imagine them taking equal place and holding their own amongst those of far better known composers.